How Long Do Angel Trumpets Stay in Bloom? What Is an Exotic Angel Plant? Are Angel Trumpet Plants Toxic? Angel trumpets, or brugmansia, are exotic, long-lived South American perennials that are hardy to USDA zone 9. These plants thrive in climates with warm and humid days and cool nights. You can propagate angel trumpets from seeds or from cuttings, which are easy to grow. You can also clone cultivars. Clip semi-ripe wood tip cuttings from a mature, healthy angel trumpet plant when the plant is actively growing. The cuttings should be 6- to 8-inch-long stems that are beginning to change from green to brown, and about 3/8 of an inch thick. Strip the stems of buds and all but the uppermost set of small leaves. Place the fresh cuttings in 2 or 3 inches of distilled water in a clear glass or plastic jar. Distilled water is preferable because it doesn’t contain impurities found in tap water. Use a permanent marker to draw a line on the container indicating the starting water level. Set the cuttings in a warm location with plenty of bright, indirect light. If the humidity level is low, create a bubble over the top of the container with a clear plastic bag secured by a rubber band. Poke a few holes in the bag to provide adequate air circulation. Change the water each day or every other day. Keep the water level consistent with the line on the container. Plant the cuttings in individual pots when new leaves develop and the roots are several inches long, typically in two to four weeks. Prune back spent flower heads throughout the growing season to keep the tree tidy looking and encourage fresh bloom production. Snip the flowers from their short green stems with clean sharp secateurs and compost or discard the blooms. Prune your brugmansia as needed during the growing season to remove broken, dying or diseased branches or blooms or any other sign of distressed plant material. Cut away any troublesome areas back to the point of healthy tissues and discard the clippings in the trash. Bypass the compost pile if disease is in any way suspected for the damage to the cuttings. Prune the brugmansia for height and spread as you desire in keeping with your garden space. Cut each individual branch back to the desired length with secateurs (pruning shears). Don't remove more than one third of the bulk of the tree in any single pruning session. Angel trumpets bloom throughout the summer, beginning in May and extending through September. To keep the plant flowering, remove dead flowers when they fade. The flowers are known for their shape, beauty and fragrance. Peel the covering off of the seeds. If you find it difficult to remove the seed covering, soak them in a small bowl of water for 30 minutes. The skins should peel right off after that. Place the seeds into a mixture of 1 tablespoon of hydrogen peroxide and 3/4 cup of water. Allow them to soak for 10 minutes. This will help to remove any bacteria or fungus that might be on the seeds. Fill the planting pots with potting soil and moisten with water until it drains from the bottom of the pots. Plant the seeds 1/4 inch into the soil, three to a pot. They need to be barely covered with soil. Place the pots in an area that gets lots of sun. They need to be kept warm during germination, so if you need to, you can place the pots under lights. Mist the soil daily. Watering normally may disturb the seeds that were planted shallow. Transplant the seedlings when they have four sets of leaves and give them their first application of fertilizer. The first feeding should be a diluted solution of one-quarter of the recommended on the package. Exotic Angel Plants are tropical plants grown specifically for indoor use and branded by Hermann Engelmann Greenhouses ("Engel" means "angel" in German). Plant Devil's Trumpet seedlings approximately 2 feet apart in rich, drained soil that gets daily exposure to full sunlight. Giving the flowers this room will ensure that they are able to reach their full height, which will reach anywhere from 2 to 3 feet. Wait until one week after the last frost before planting this annual to ensure it survives. Water the plants one to two times a week during times of drought or minimal rainfall. Check the soil and, if it is dry, water the plant and wait to water it again until the soil completely dries out. The plant does not require watering if there is rainfall every one to two weeks. 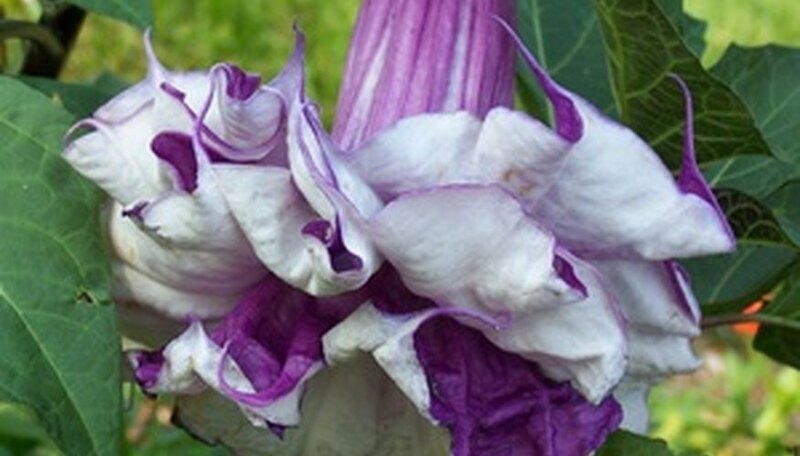 Avoid over-watering the Devil's Trumpet as this will kill the plant. 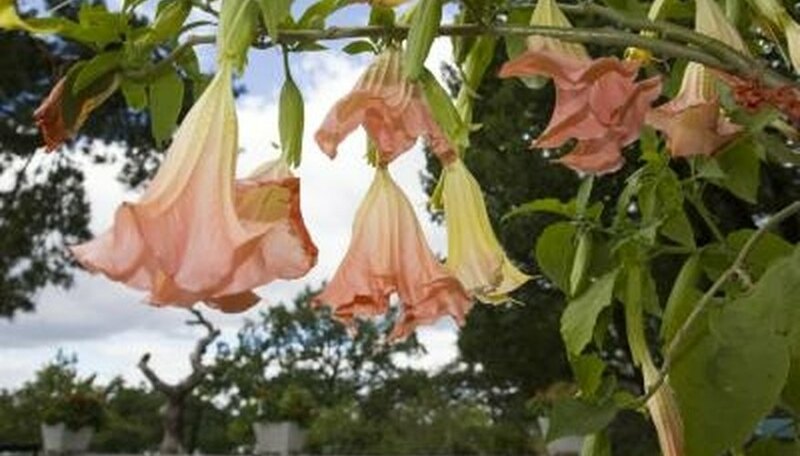 Fertilize the Devil's Trumpet plants once a month with an all-purpose fertilizer. This will provide the plant with the necessary nutrients. Use the fertilizer according to the package directions. Stake the Devil's Trumpet once it reaches approximately 2 feet in height. This will ensure that it is not knocked over by storms of strong winds. 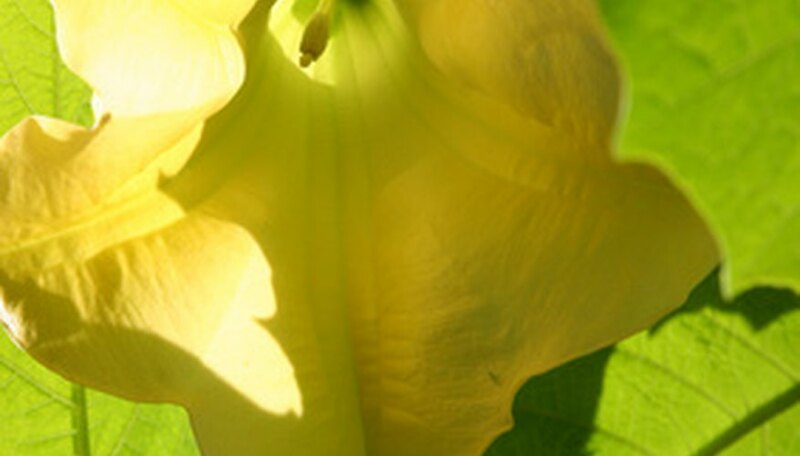 Angel's trumpet plant, also called brugmansia, can fall prey to many bugs. Spider mites, aphids and mealy bugs are common culprits. To stop bugs from eating the leaves on an angel's trumpet plant, spray a miticide such as Avid or an insecticide like pyrethrum. Raise angel's trumpet tree in full morning sun and afternoon shade. Even if you live in southern Florida, keep it as a potted plant to make it easy to move it in and out of sunlight. Water angel's trumpet to the root zone whenever the soil surface begins to dry. Although the tree survives drought, it loses its flower buds when regular moisture is interrupted. Apply a balanced fertilizer with equal amounts of nitrogen, phosphorous and potassium. Buy a water-soluble type and feed it to the angel's trumpet tree every other week. Follow the application rates indicated on the label of the product you select. Grow angel's trumpet in temperatures above 40 degrees Fahrenheit to prevent the plant from shutting production down. Plant it in a pot so you can take it inside in cool weather. Place it by a sunny window. Angel's trumpet is also known by the scientific name Datura innoxia. This plant contains toxic alkaloids that can cause symptoms of plant poisoning to occur. Ingestion of this plant can cause adverse effects such as agitation, twitching movements, drowsiness, hallucinations and elevated temperature, states the Government of Canada. Ingestion of angel's trumpet has caused humans to lapse into a coma, as well. Animals that ingest the leaves, flowers or seeds of the angel's trumpet plant can experience toxic effects. The most common symptoms associated with ingestion of this plant are gastrointestinal. The animal's cardiovascular and nervous system are often affected as well, according to the American Society for the Prevention of Cruelty to Animals. Keep animals and children away from this plant or remove it entirely from your yard or garden to avoid accidental ingestion. If accidental ingestion occurs, consult a doctor or veterinarian immediately for a proper diagnosis and treatment plan. Take a piece of the angel's trumpet with you to the doctor or veterinarian for plant identification purposes. Inspect the plant for aphids. The insects congregate on the underside of the angel's trumpet plant's leaves and at the junction of the leaf and the branch. Though aphids may be present all year, they are most common in March and April, according to the University of Wisconsin. Spray affected foliage with a standard insecticidal soap, obtained from most garden stores and nurseries. Mist the soap directly on the underside of the leaves where the aphids are located. The soap will kill them upon contact. Inspect the foliage again after seven to 10 days. Re-treat, as necessary. New aphids may have hatched or moved onto the plant since you last applied the insecticide.